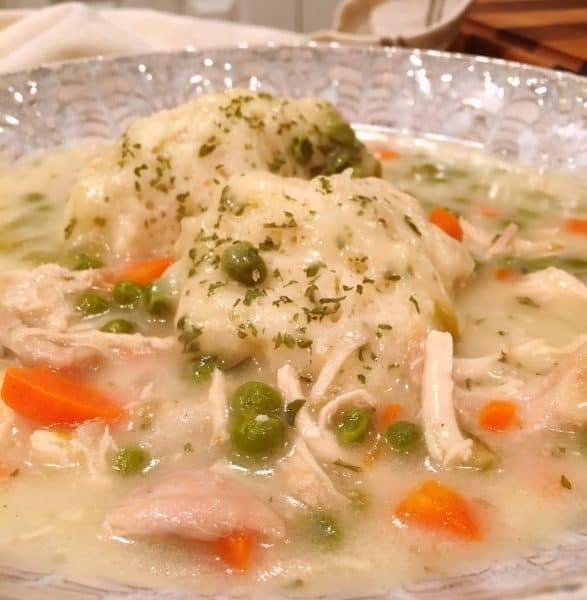 How easy is it to create a scrumptious pot of Creamy Chicken and Fluffy Herb Dumplings? Super Easy! Today I’m sharing one of my all time favorite Winter dishes! We can dispute all day which comfort food is “King” of comfort foods. Everyone would have a different opinion…and they would all be great! 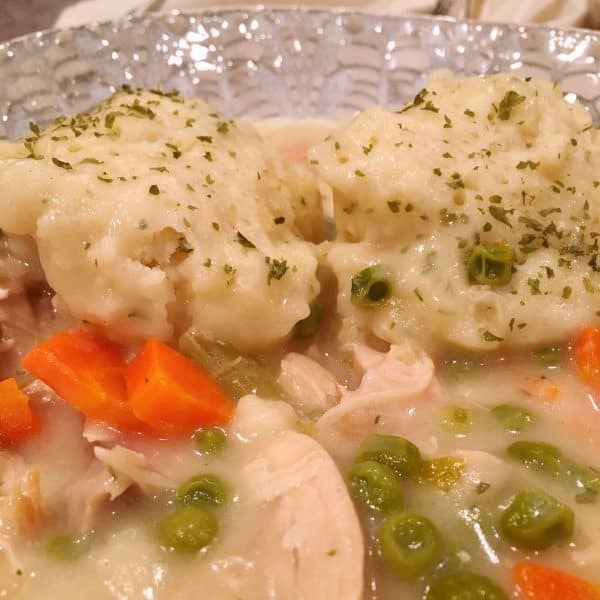 However, in my humble opinion… a steaming bowl of Old Fashioned Creamy Chicken and Dumplings will win hands down every time! Every spoonful is like a big comfy blanket being tucked in around you! (Who couldn’t use a big warm blanket this time of year…say’s the blogger with chattering teeth! lol) It could be the deep rich creamy broth loaded with chunks of tender chicken and vegetables, or the amazing light and fluffy herb dumplings! It could be BOTH! A true marriage made in heaven! It’s not has hard as you’d think! 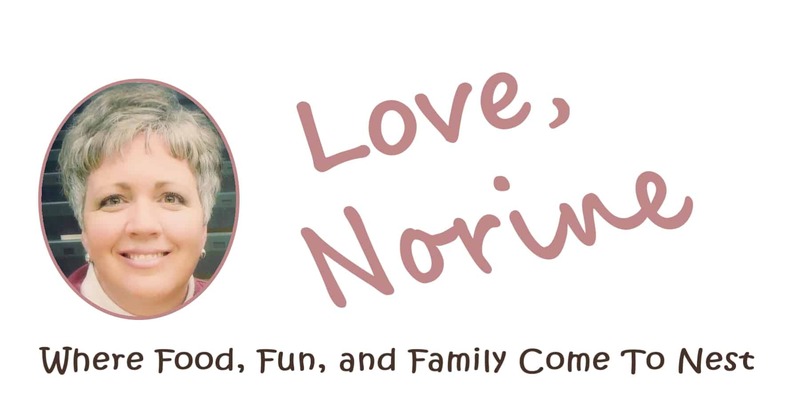 I know…a lot of you are saying “Well sure Norine…if you can cook it’s not hard!” Nope…not the case. I promise! This is an easy dish to prepare, but there are a few tips I’m going to share to make it as easy as possible. Great Soups start with a GREAT Base! In a Large pan, or Cast Iron Pot, place your chicken, or chicken pieces, in 8 cups of water. Add one chicken bullion cube for additional depth of flavor. Over medium-high heat bring pot to a boil. Cover and reduce heat to medium. Cook for 1 hour or until the bones pull away from the chicken easily. Carefully remove chicken from pot. Save your stock! You need every drop of that delicious broth! Remove meat from bones and skin, discard bones and skin (Please do not put them back in the soup! Unless ya want to kill someone with this dinner!) and return to stock. Add 1/2 cup chopped onion, 3/4 cup chopped celery, 1 cup chopped carrots and 1 cup frozen Peas. Add salt and pepper to taste. Add 1 Tablespoon dried parsley flakes. 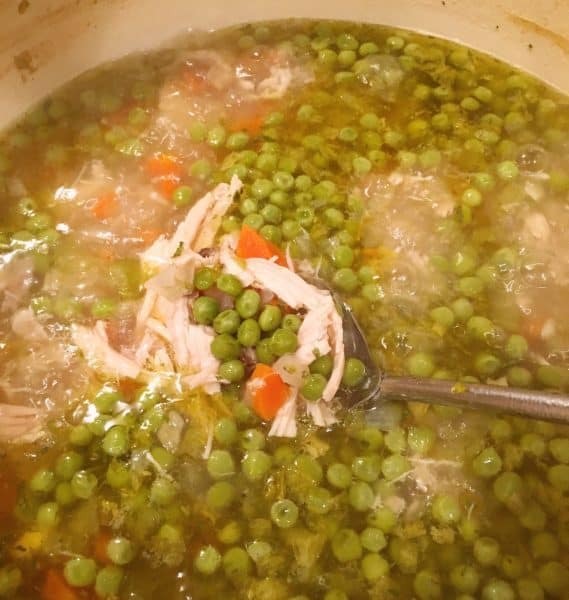 NOTE: The Peas are optional! Please Pea Haters of the World do not message me! Y’all are passionate about your hate of Peas! Peas are ALWAYS optional unless it’s Pea Salad…then they are a must! Cover and bring to a boil over medium heat. Cook for 30 minutes until vegetables are tender and stock has reduced by about an inch. Notice my stock line mark on the inside of my pot? We need a reduction of broth so that we will end up with a thick rich creamy soup. However, it’s important that you still have liquid in the pot for the dumplings to cook properly. So if it has reduced too much…add another cup or two of water. How Do You Make Good Dumplings? I’m so glad you asked! I truly believe we over complicate bread recipes! Whether it’s quick breads, or yeast breads…we’ve become terrified of making them because of all the “hype” that we can mess them up! Can we mess them up? Sure we can! We can mess up any recipe…including boiled eggs! However, I’m going to share some simple tips to have you making beautiful dumplings first time out of the gate! While the vegetables are cooking let’s make dumplings! Pastry Blender. I just ordered this amazing 5 star pastry blender from Amazon. 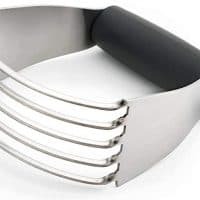 NOTE: I try to stay away from aluminum bowls when cooking and baking because they can change the composition of a recipe especially when using acidic foods or eggs. Granted we aren’t using either in these dumplings…but I just don’t want to risk having any metallic taste in my food…EVER! 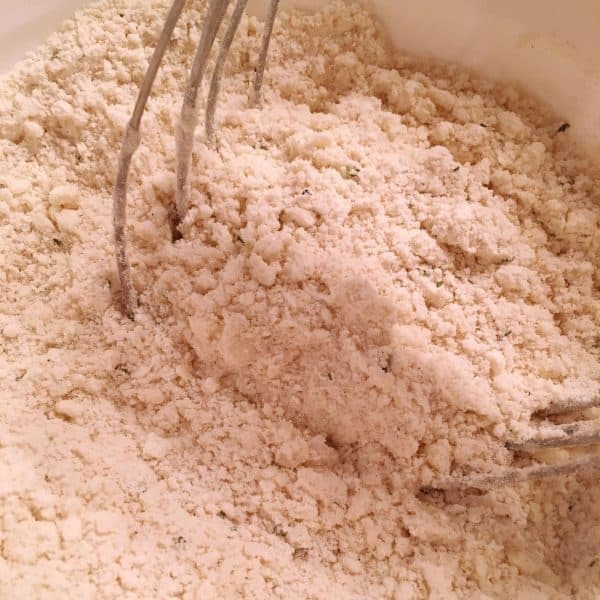 In a medium size bowl add 2 cups of All-Purpose Flour, 1 Tablespoon baking powder, 1 teaspoon salt, 1 Tablespoon White Sugar, 1/2 Tablespoon Parsley, 1/8 teaspoon ground sage, and 1/4 teaspoon thyme and a dash of garlic powder. Using a wire whisk blend ingredients together. Please do not skip this step! Using a wire whisk to blend the ingredients together is like “sifting” the flour and adds air to the mixture and breaks up any clumps. So in a nutshell…it’s an important step. 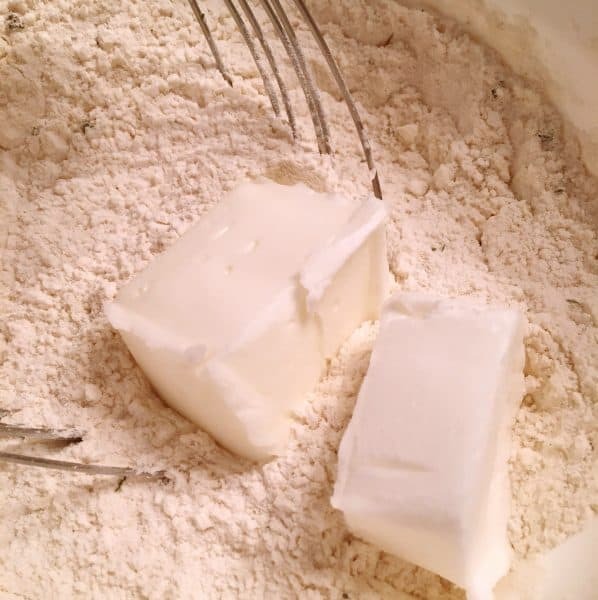 Using your pastry blender, cut in 1/3 cup shortening. This is one of those “important” steps to good dumplings. The better you cut the shortening in the more dispersed the shortening will be creating the “air pockets” for a fluffy dumpling! Add 1 cup of Milk. Carefully stir together until a sticky dough begins to form. That’s it for the dumpling dough! You’re ready to make dumplings! DO NOT OVER MIX! The one thing dumplings, or biscuits, do NOT like…being over handled! They’re like all Moms…they want us to stop touching them!!! This is supposed to be a very sticky dough! We aren’t going to “knead” it…we aren’t making biscuits! If we were making biscuits we would gently knead the dough 3-4 times adding in extra flour. These however are dumplings and you are going to drop them by the HEAPING Tablespoon full into the boiling pot of soup! Remove lid from pot and add the dumpling dough by the heaping Tablespoon full into the boiling broth going around in a circle and then filling the center. The dough will drop, sink, and then come back up. You’re going to feel like your blindly dropping dough into this simmering broth, and you are, but it’s okay…the dough will shift around and fill the top of the pot. Why can’t you peek? Because the Steam from the boiling broth is now cooking those dumplings! It’s like magic! Those dumplings are going to rise and become the most delectable light and fluffy biscuits you’ve ever seen! 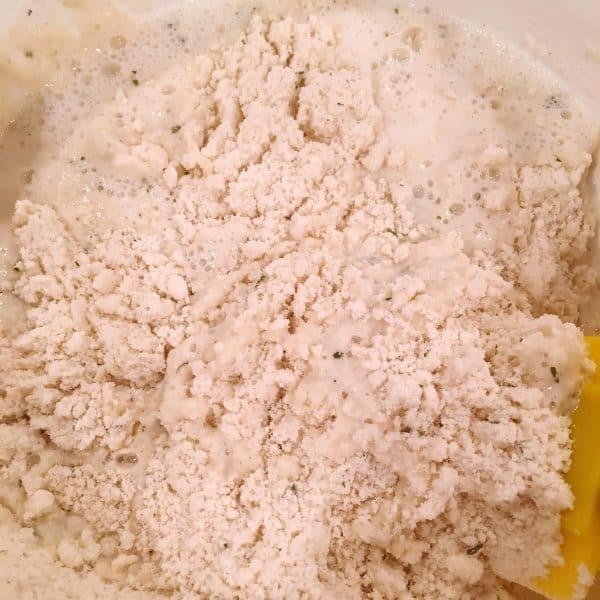 The dumpling dough, because it is flour based, is also going to thicken the broth of the soup making it creamy and rich! The flavor of herbs from the dumplings will infuse with the broth to create a wonderful taste treat! Time to lift the lid!! Just as promised…light, fluffy dumplings! They will not be golden brown like a biscuit. They aren’t supposed to be! 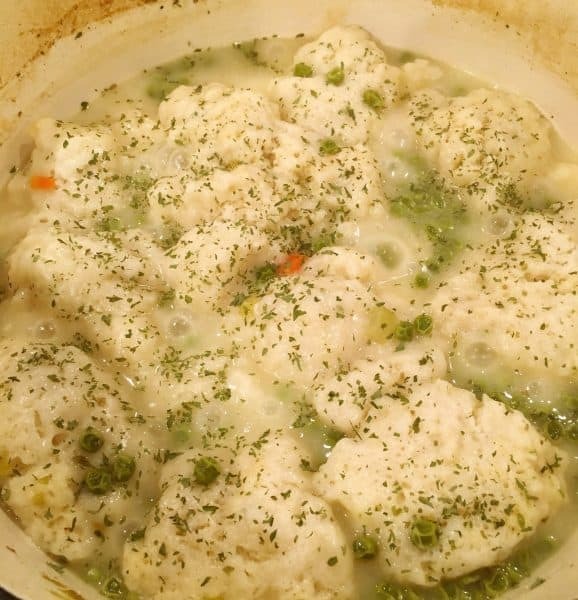 They should appear a little doughy on the outside because of the broth, yet the inside will be perfectly luscious baked dumplings. I love to serve this dish in big wide bowls! The perfect spoonful consists of a little dumpling and a heaping spoonful of creamy dreamy soup! I honestly can’t think of a better comfort food! This is why I love what I do! 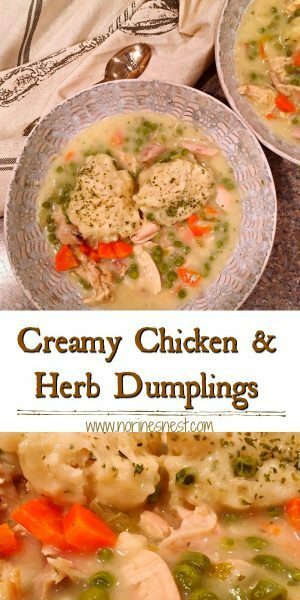 A simple dish like Creamy Chicken and Homemade Herb Dumplings can cure what ails you! Give you the warmth and love that was put into the dish by the hands that prepared it! I hope this dish brings as much warmth, comfort, and love to your Nest as it does to ours! Thanks for stopping by and visiting with me today! I’d love to have you join me every day on my Facebook Page, Instagram account or Pinterest page…where I share down home cooking and new recipes each and every day! I’m sharing this yummy recipe over on Meal Plan Monday! A great resource for all your Meal Planning needs. Click HERE to check it out! 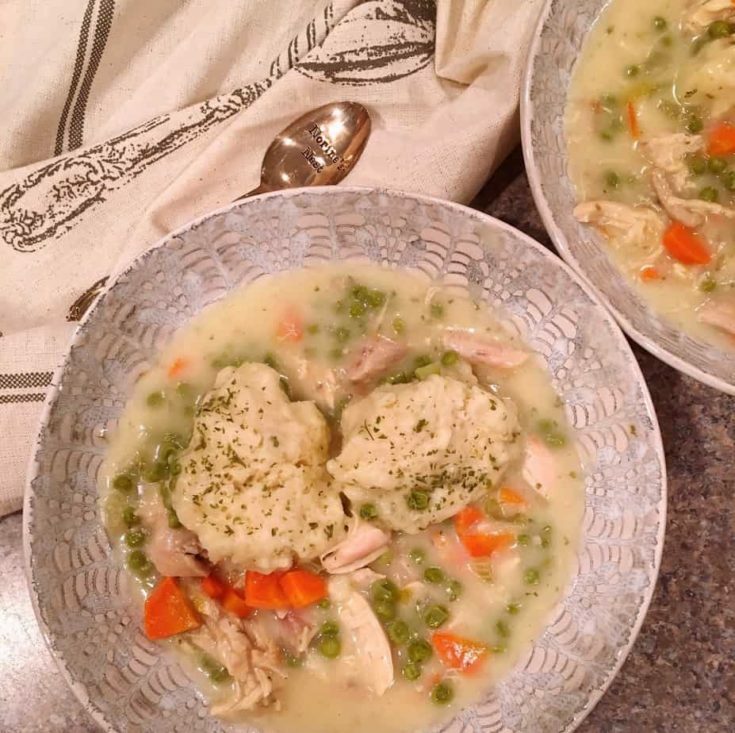 Creamy Rich Chicken and Vegetable Soup topped with old fashioned homemade drop herb dumplings. 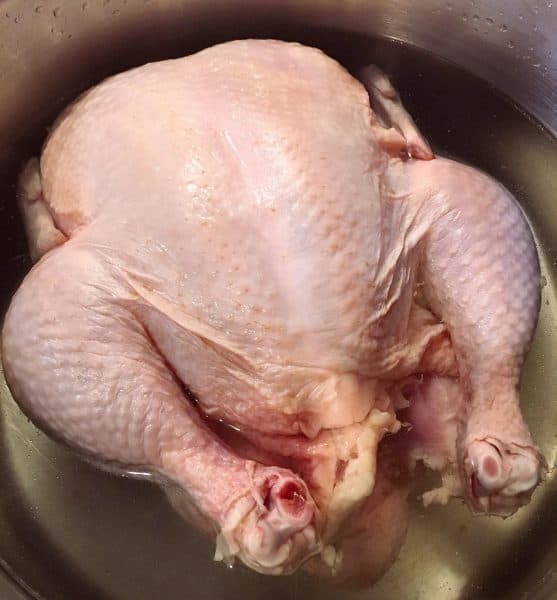 In a large pot with a lid, place whole chicken OR chicken pieces. Add 8 cups of water and bullion cube. Cover and cook over medium-high heat until boiling. Reduce heat and simmer for 1 hour until bones pull away from chicken. Remove chicken from broth, reserving all the broth, and remove chicken meat from bones and skin. Place chicken meat back in pot with broth. Add onion, celery, carrots, peas, parsley, and salt and pepper to taste. Bring to a boil. Reduce heat and simmer for 30 minutes until vegetables are tender and broth has reduced by one inch. While vegetables are simmering make dumpling dough. 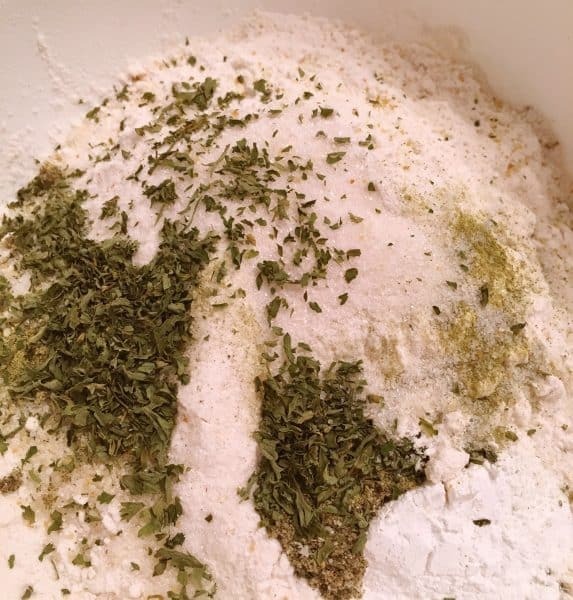 In a medium bowl add flour, baking powder, salt, sugar, parsley, sage, thyme, and garlic powder. Mix well with wire whisk. Add 1/3 cup shortening and cut in with pastry blender until coarse pea size crumble forms. Add 1 cup of milk. Stir carefully until sticky dough forms that pulls away from side of bowl slightly. Bring broth back up to a boil. If necessary add 1 cup more water if there is not enough liquid in the pot. Drop dumpling dough by heaping Tablespoon fulls into boil broth going around the pot and then filling the center with drops of dough. 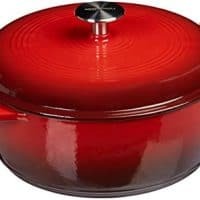 Cover pot with lid, reduce heat and allow to cook for 20 minutes. DO NOT LIFT THE LID. Dumplings will cook and soup thicken during this period of time. 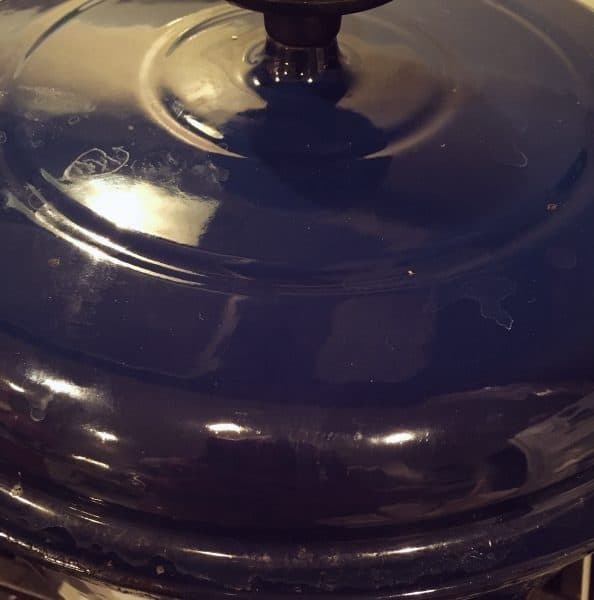 After 20 minutes remove the lid. Dumplings should be big and puffy and broth creamy. 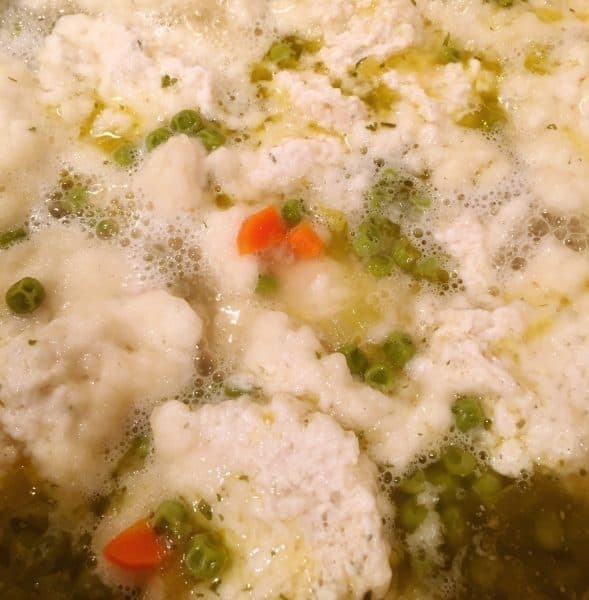 If broth isn't thick enough, cover and cook an additional 5-10 minutes, but no longer as dumplings will over cook. Broth will thicken as it slightly cools. As a died in the wool Pea hater – I substituted finely diced frozen string beans for those hateful peas. That is the only change I made except that I only had 3 large chicken breasts with the skin on and rib bones; so I used those and it was totally wonderful. Thanks for sharing this great recipe.